In the aftermath of the Great Recession, many commentators remarked that the era of U.S. dominance of the global economy and position as sole superpower were at an end. However, in the intervening years, a sustained economic recovery in the U.S. has bolstered its leadership credentials, and in the current survey, about twice as many people worldwide say that the U.S., and not China, is the world’s leading economy. Nonetheless, global publics continue to express the view that China either has or eventually will replace the U.S. as the leading superpower. Majorities or pluralities have positive sentiments towards China in 27 of the countries surveyed in 2015. China’s image has improved in the last year across the countries polled. And these favorable views are particularly evident among the young. But China’s human rights record is still a stain on its reputation. On balance, the publics surveyed believe that the Chinese government does not respect the personal freedoms of its people. Across the 40 countries surveyed in spring 2015, a median of half say that the U.S. is the world’s leading economic power. Only 27% across these same nations say that China is the top global economy. A median of 6% name Japan as the top economy, while 5% cite the nations of the EU. Majorities or pluralities in 30 of 40 countries name the U.S. as the top economy, including all of the African and Latin American countries surveyed. Six-in-ten or more say the U.S. is the global economic leader in Senegal, Kenya, Tanzania, Uganda, Ghana, Ethiopia and Mexico. In all of these nations, roughly a quarter or less say China is the leading economic power. In every Asian-Pacific country surveyed but one, people choose the U.S. as the leading economic power, including 66% in India and the Philippines. 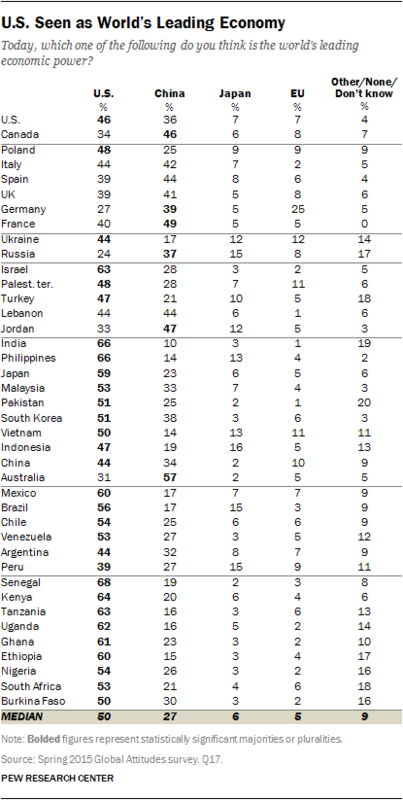 Even in China, 44% say that the U.S. is the top economy, while only 34% name their own country. In Australia, however, a majority (57%) see China as the world’s economic leader, while 31% name the U.S.
On balance, the Middle Eastern countries polled say the U.S. is the number one economy, with 63% of Israelis expressing this view, as well as 48% of Palestinians and 47% of Turks. But Lebanese are split (44% U.S., 44% China) and a plurality of Jordanians (47%) say China is the economic leader. During a grim time for U.S.-Russia relations, 37% of Russians say China is the leading economy, while just 24% believe it is the U.S. In the EU, opinion on the balance of power between the Chinese and American economies is on a knife’s edge. In Italy, Spain and the UK, nearly equal numbers choose either country as the number one economy. But in France and Germany, public opinion tilts more toward China (49% and 39% respectively), while a quarter of Germans also say the countries of the EU are the leading economic power. However, a 48%-plurality in Poland says the U.S. is number one. Americans tend to believe their country is the leading economic power (46%), although 36% name China. It is the opposite in Canada, where 46% say China is the world’s top economy and 34% name the U.S. In half of the countries surveyed in 2014 and 2015, there has been a significant increase in the belief that the U.S. is the world’s economic superpower. This includes double-digit gains in India, the Palestinian territories, Kenya, Ghana, Pakistan, Uganda, Venezuela, Malaysia, Senegal, Nigeria, Ukraine and South Africa. There has also been a rebound in some European nations (Poland, Spain and Germany) when it comes to seeing the U.S. as the top economy, helping it to draw even in a contest that was clearly in China’s favor in the years following the Great Recession. In the U.S. itself, more people now say the U.S. is the global economic leader compared to any previous survey going back to 2009. In China, many fewer people now say the U.S. is the world’s leading economy compared with 2014 (-11 percentage points). Significant drops also occurred in Asia among South Koreans (-9) and Vietnamese (-6). When asked about the future, people around the world are generally convinced that China either will eventually replace or already has replaced the U.S. as the world’s leading superpower. Overall, majorities or pluralities in 27 of 40 countries surveyed say this. 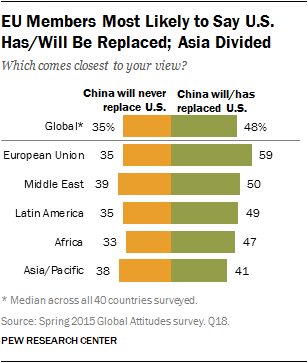 It is important to note, however, that in no country do more than 26% say China has already replaced the U.S. Instead, the more common view is that China will eventually take its place as the global superpower. Around equal numbers of Americans say China has replaced or will eventually replace the U.S. as the world’s leading superpower as say that China will never replace the U.S. (46% vs. 48%). By a 52%-40% margin, Canadians think that China will or has replaced the U.S.
European Union countries surveyed all agree that China will become the world’s top power, ranging from 66% in France to 46% in Poland. Among the regions surveyed, Europeans are the most convinced that the U.S.’s days as top power are numbered. Middle Easterners are also convinced that China will eventually overtake the U.S., including 56% of Israelis. Countries in Asia and the Pacific have the most diverse opinions when it comes to China’s status as a superpower. Overall, a median of 41% in these countries say China will or already has replaced the U.S., while 38% say it will never happen. More than half in China (67%), Australia (66%), South Korea (59%) and Pakistan (53%) say China will eventually be the world’s leading power. A plurality of Malaysians also agree, but Indians are split on this issue. Meanwhile, roughly two-thirds or more in Japan (77%), Vietnam (67%) and the Philippines (65%) say that China will never replace the U.S. as the globe’s superpower, which are the highest such readings across the countries surveyed. Latin American publics generally think that the U.S. will lose its position as the globe’s superpower, but not every country in the region agrees. The most likely to say China will surpass the U.S. are Argentina (56%), Chile (53%) and Peru (50%). However, 56% of Brazilians say the U.S. will never be replaced. In the nine African nations surveyed, pluralities in six believe the U.S. will be replaced by China, including roughly half in Burkina Faso, Senegal, Tanzania and Kenya. In 17 of the countries surveyed, younger people are more likely to say China has or will replace the U.S. as the leading superpower. For example, 65% of Canadians ages 18-29 think China will or has replaced the U.S., while only 46% among those ages 50 and older say the same. This age gap also exists in the U.S. itself, as well as a diverse array of countries across the globe. A median of 55% of people across the countries surveyed (excluding China) have a favorable opinion of China. This includes majorities or pluralities with positive sentiment towards China in 27 of 39 countries. Favorable views are more concentrated in Africa and Latin America, but there are divergent opinions in China’s home region of Asia. The most favorable views of China are found in Pakistan, Ghana, Russia and Malaysia. China has deep economic ties with each of these countries and has become more strategically entwined with Russia over the past year. This may help explain the 15 percentage point increase in positive views toward China in Russia since 2014. And in Malaysia, 88% of ethnic Chinese have a positive view of China, while roughly three-quarters of ethnic Malays (74%) agree with this assessment. Elsewhere in Asia, views of China vary greatly. Half or more in Indonesia (63%), South Korea (61%), Australia (57%) and the Philippines (54%) hold a favorable opinion of China. A plurality of Indians agree (41% favorable, 32% unfavorable, 28% no opinion). People in Vietnam (74% unfavorable) and Japan (89%) have a decidedly negative view of their region’s dominant economic power. 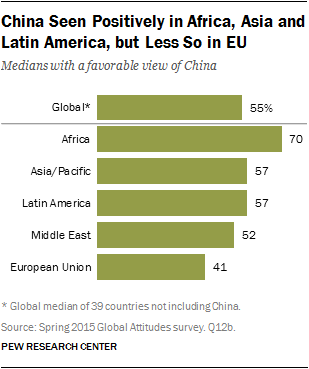 Majorities or pluralities in all of the African and Latin American countries surveyed have a positive view of China. Highest praise can be found in Africa, where seven-in-ten or more in Ghana, Ethiopia, Burkina Faso, Tanzania, Nigeria, Senegal and Kenya have favorable views of Beijing. Meanwhile, around six-in-ten or more in Chile, Peru and Venezuela express favorable attitudes toward China. Middle Eastern publics are more divided on China. Half or more in Israel and the Palestinian territories like China, but majorities in Jordan (64%) and Turkey (59%) do not. Israeli Arabs (85%) are much more likely to have favorable views, compared with Israeli Jews (49%). Overall, the Lebanese are split, but there is a distinct religious break among Shia Muslims (81% favorable), Christians (47%) and Sunni Muslims (29%). Europeans and North Americans are less sanguine about the Asian giant compared with the rest of the world. In Europe, Germans and Italians have the highest unfavorable views of China (60% and 57%, respectively). The Spanish also have, on balance, negative views. People in France and Poland are almost equally divided, while slightly more people in the UK have a positive opinion of China (45%) than a negative one (37%). In the U.S. and Canada, only about four-in-ten have a favorable view of China. Over half of Americans (54%) express an unfavorable view, but distaste for China is more evident among Republicans (63% unfavorable) than Democrats (50%). In the past year, ratings for China have risen slightly across the 35 countries surveyed in both 2014 and 2015. In 2014, a median of 49% had a positive view of China across these countries, but in 2015 it is 54%. Meanwhile, negative views have dropped from 38% to 34%. Positive opinions of China have become more common in 12 countries over the past year. 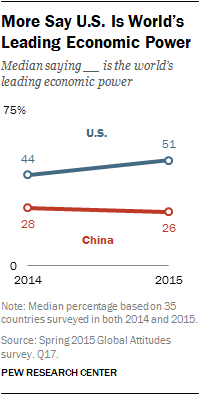 Of note, Filipinos are more keen on China in 2014 compared with 2015 (+16 percentage points). This might be due to the fact that relations were at a low last year after a confrontation between a Filipino supply ship and a Chinese coast guard vessel in the South China Sea. And in India, which Chinese President Xi Jinping visited in the fall of 2014, favorable opinions of China are up 10 points. 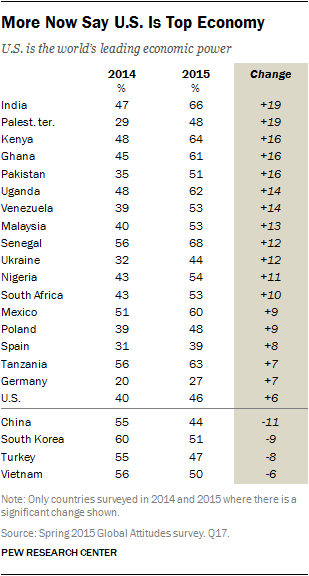 In 18 countries surveyed, younger people are more favorable towards China than their elders. The largest difference between young and old on positive sentiment of China is found in the U.S., where 55% of young Americans (18-29 year-olds) have a favorable view of China while only 27% among those ages 50 and older agree. Significant age gaps of 15 percentage points or more also appear in Brazil, Spain, the Palestinian territories and Mexico. South Korea is the only country with the opposite pattern. Older South Koreans have more favorable views of China than do their younger counterparts. There is also a gender gap on opinions towards China. In 17 countries, men are more likely than women to have a positive view of China. This includes Germany, where 42% of men have a favorable view of China compared with only 25% of women. It should be noted that in Pakistan, Vietnam, Brazil, Argentina and many African countries, part of this gap can be explained by women being less likely to have an opinion about China. While overall ratings for China are mostly positive, that is not the case on the issue of individual liberty. Across 39 countries, a median of 45% say the Chinese government does not respect the personal freedoms of its people, while only 34% say that it does. Publics in the EU and North America are the most likely to say that China does not respect the rights of its people. Around eight-in-ten or more among the eight countries surveyed in these regions say that China does not respect the freedoms of its people, including 93% in France, 92% in Germany, 88% in Spain, 86% in Canada and 84% in the U.S. No more than 11% in these places say that China respects individual liberty. In Asia, publics are very divided on this issue. On the one hand, eight-in-ten or more in Japan (93%), Australia (81%) and South Korea (81%) say that China does not respect the rights of its people. On the other, six-in-ten or more in Pakistan (65%), Indonesia (60%) and Malaysia (60%) say the Chinese government does respect personal freedoms. Indians and Filipinos are split. Middle Eastern publics are also divided on this issue. Nearly two-thirds in Israel (64%) and 58% in Turkey say Beijing ignores the human rights of its people. But around two-thirds in Lebanon (67%) and the Palestinian territories (66%) say China does respect personal freedoms. Israeli Arabs (54%) are much more supportive of China’s rights record than are Israeli Jews (20%). Lebanese Shia Muslims (86%) and Christians (64%) are more likely than Sunni Muslims (49%) to give Beijing a positive rating on this question. Russians also believe that China respects the rights of its people (52%), while only 29% of Ukrainians agree. People in Africa are the most positive about China’s human rights record. 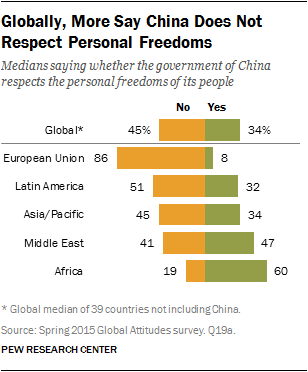 A median of 60% across the nine African countries surveyed say the Chinese government respects personal freedoms. This sentiment is highest in Ghana (69%), Kenya (66%) and Ethiopia (64%). However, only 40% in South Africa say the same. While not drastically changed since 2014, a year which saw a very public demonstration in Hong Kong regarding democratic rights for the Special Administrative Region, the belief that the Chinese government does not respect the human rights of its people is up across the 35 countries surveyed in both years. Today, a median of 45% think the government of China does not respect the personal freedoms of its people, up from 40% in 2014. There were significant increases in the view that China does not respect individual rights in 14 of the countries surveyed in both years.